Sustainable and Nonconventional Construction Materials Using Inorganic Bonded Fiber Composites presents a concise overview of non-conventional construction materials with a strong focus on alternative inorganic bonded fiber composites and their applications as construction components. It outlines the processing and characterization of non-conventional cementitious composites, which will be of great benefit to both academic and industrial professionals interested in research, development, and innovation on inorganic bonded fiber composites. The book gives a comprehensive review of the innovative research associated with building components based on inorganic bonded composites. 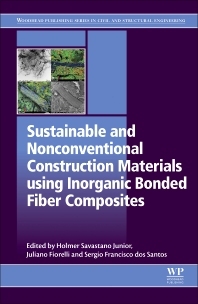 Exploring both natural fibers as reinforcing elements and alternative inorganic binders based on agricultural and industrial wastes, this book also considers the performance and applications of fibrous composites as construction materials and components. Holmer Savastano Junior received his doctorate degree in Civil Engineering from the University of São Paulo, Brazil, in 1992 and then later completed a post-doctoral fellowship at Forestry and Forest Products, Commonwealth Scientific Research Industrial Organisation, Australia (FFP, CSIRO, 1998-1999). He was appointed Dean (2005-2009) of the School of Animal Sciences and Food Engineering (FZEA, Pirassununga campus), University of São Paulo, as well as being a full Professor since 2005. Professor Savastano Jr. was also the first Head of the Biosystems Engineering Department at FZEA USP (2012-2014) and was the Co-Editor in Chief of the Brazilian Journal of Constructed Environment (Antac, Porto Alegre, since 2010-2016). He is a member of advisory committees at Capes, CNPq and FAPESP (Brazilian major Funding Agencies) in the Engineering area. He has more than 140 papers published in peer reviewed journals and is the PI of numerous projects in collaboration with other Brazilian and international research institutions. Holmer has experience in Civil Engineering, with emphasis on Materials and Components for Construction, specifically in the following subjects: vegetable fiber and bamboo, rural construction, civil construction and sustainability. Juliano Fiorelli graduated in Civil Engineering from the Federal University of São Carlos (1999), received his master's degree in Materials Science and Engineering from the University of São Paulo (2002) and a PhD in Materials Science and Engineering from the University of São Paulo (2005), Brazil. He has experience in the area of Civil Engineering, Materials Engineering and Rural Construction, with interest on the following topics: unconventional materials, particle board, wood, wood structures, glued laminated timber, mechanical properties of wood, animal welfare and technical drawing. Sérgio Francisco dos Santos graduated with a BSc in Physics from the University of São Paulo (1995), a master's degree in Materials Engineering (1999) and PhD in Materials Science and Engineering from the Federal University of São Carlos (2005), Brazil. He works mainly in the following areas: advanced structural ceramics, cement composites reinforced with lignocellulosic/vegetable fibers, polymers and glass for sustainable and non-conventional building construction and mechanical properties.